In this installment of therunonsentence.com, Cole sells-out for a product he has no vested interest in, and explains why you’re all drinking the wrong sports drink. Stop everything you’re doing, investors get out your cheque books, put in earplugs if you got ’em because in a few minutes when I blow your brain, you’re going to need them too keep your liquified cranium from pouring out your ears. Here’s the well-kept secret that’ll make you faster than Bolt. When it comes to nutritious hydration, don’t look to Gatorade or Powerade, cheetah piss or coconut water, but listen to this one weird trick that doctors hate me for and PepsiCo doesn’t want you to know: the all-natural superfood called blackstrap molasses is the best electrolyte replenisher there is. Period. Sadly, some of you might be sappy suckers for saccharine, and think of molasses as a mere byproduct of the sugar refining process, the third and final run off from the purification of sugar (how cute!). But sweetheart, the truth is that the “sugar refining process” or as we enlightened big-boys call it “hyper-mineral-concentrate-enhansing-de-sucrosification™” is not about getting sugar, but removing the sugars from the cane juice and pawning it off to the commoners to put it in their Gatorade, leaving us with the goldmine, the sweet robust nectar, blackstrap molasses. Shhhh… don’t tell anyone, except everyone you know. The mere 3 tablespoons I mix into water post-workout have more potassium than 4 bananas, more magnesium than 3 cups of spinach, comparable calcium to a cup of milk, and, if you’re anemic-prone as I am, more iron than a 12 oz steak. It is missing sodium, but nothing could be easier to replace — just add a pinch of table salt. 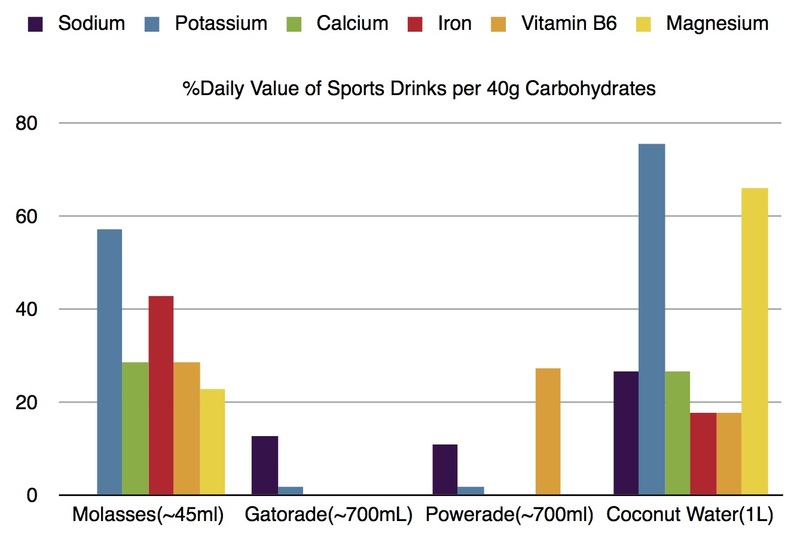 In the graph, it might seem like coconut water rivals molasses, but when you consider that we’re comparing a liter of coconut water to only 2.8 tablespoons of molasses (22 times less volume), and that you’ll pay more than ten times more for that amount of coconut water than you will molasses (yes, that’s right, molasses is cheap! ), it’s hardly a competition. The question becomes not why, but how do you drink your molasses? I take mine in water, and like Bond, I prefer it shaken, not stirred, it gets a foamy head, and for a second, with it’s deep brown colour, I can trick myself into believing that I’m a real college student chugging a Guinness. But you could put it in your oatmeal, mix it in your baked beans, spread it on your pancakes like syrup — wherever you’d like, you’re getting more nutrients than the alternative. “But Cole,” you say, “you are what you eat, and I sure as Sherlock don’t want to be as slow as molasses!” Sorry Honey, but you’re sadly mistaken about the speed of molasses. In fact, molasses is deadly quick, it just keeps it a secret. Have you heard of the Boston Molasses Disaster? In 1919, a molasses tank collapsed, and unleashed a tsunami of molasses, twenty five feet high, which leveled several city blocks, injuring 150 people and killing 21, more in a single afternoon than Gatorade has killed or injured in its entire history. (So, although I’d love to see molasses become the sports drink of choice, we can stick to Gatorade for celebratory dumpings on Coach, for safety reasons.) Molasses, therefore, is the most badass and deadly drink on the market (save for water, which I’m pretty sure more than 21 people have drown in), and is also one of the fastest — the Boston tidal wave wreaked havoc at 35mph. That’s 56km/h, 15.5 m/s. If Bolt raced this molasses over 100m, he wouldn’t make it to 70m before the molasses had already crossed the line. 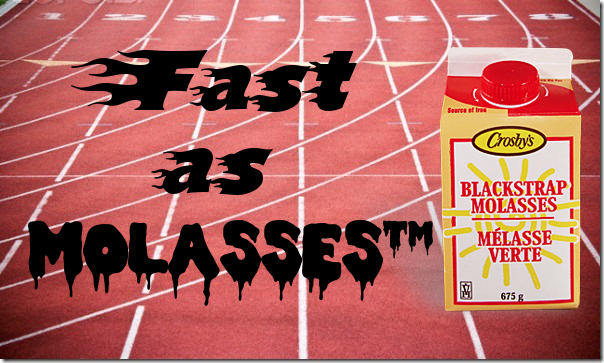 So, if you want to beat Bolt, all you got to do is harness the blackstrap, and run as fast as molasses. Ooh, did you hear that assonant ring? Fast as molasses. Yeah, that’s good. This marketing campaign is writing itself. It’s a simple recipe for our Super Bowl commercial: dark brown colour scheme, camera tight on a football, hut-hut-hike to our protagonists as he races downfield, a wave of molasses knocking out the defensive line. The backing track, of course, is “Who Gon Stop Me” and the lyrics go This is something like the Holocaust/Millions of our people lost as the wave continues to obliterate every opposing team member. Touchdown protagonist. He grabs a surfboard, and rides the wave out of the stadium through the city Who gon stop me, huh? And although everyone on the street sprints from the sticky tsunami, no one but our gnar-shredding protagonist (and a cute girl he swoops up, kisses, and tosses to safety) can stay ahead of the blitzing wave, which he surfs into the middle of a streetball game, stealing the ball and hopping off his board, dribbling downcourt, and leaping spread-eagle over the last defender in a devastating slam-dunk, clinging to the rim as the wave passes underneath him. Cut to: camera tight on the sticky losing team as a deep voiceover says “Don’t get swallowed by dehydration…” Our protagonist drops down from the rim, takes off his helmet and dips a cup in the pool of molasses at his feet. “Drink… Fast as Molasses™.” A bead of sweat runs down his forehead, visually paralleling the molasses running down his cup. He drinks up. And in this magical moment of advertising, we’ll reach the part of the backing track where Jay-Z raps Blackstrap: you know what that’s for and we’ll finally know the answer: blackstrap molasses is for hydration. Although the tone I took here was often satirical, the hard nutritional data presented is true, and I do fully endorse blackstrap molasses. I even spoke to a sports scientist about molasses, and he called my idea “not crazy”, noting that the glucose fructose of ratio of molasses is remarkably ideal as well. I see that you’re gearing up for a marathon, best of luck! Thanks Cole. Molasses sounds like something I can incorporate into my recovery drinks so I’ll definitely look into it. Thanks for the tip!